Hey everybody, finally was able to play again after an eight month hiatus. It’s been too long. Unfortunately I probably won’t be able to play again for a while, but the game I did play was memorable and fun! After rereading woelf’s review of El Garante, I was inspired to use her, with none other than the Spanish Native Canoes to provide cheerleaders to complement the Garante’s ability. 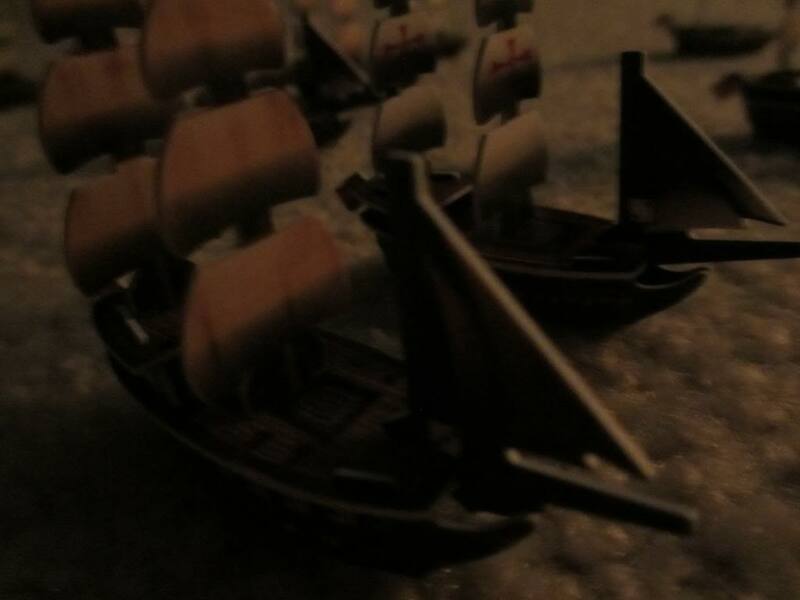 To round out the Spanish fleet, I went with the Rafael, a four masted schooner from DJC that I hadn’t used before, and HMS Trepassey, which is an English ship that I threw in since I hadn’t used her either, being one of the newer additions to my fleet. 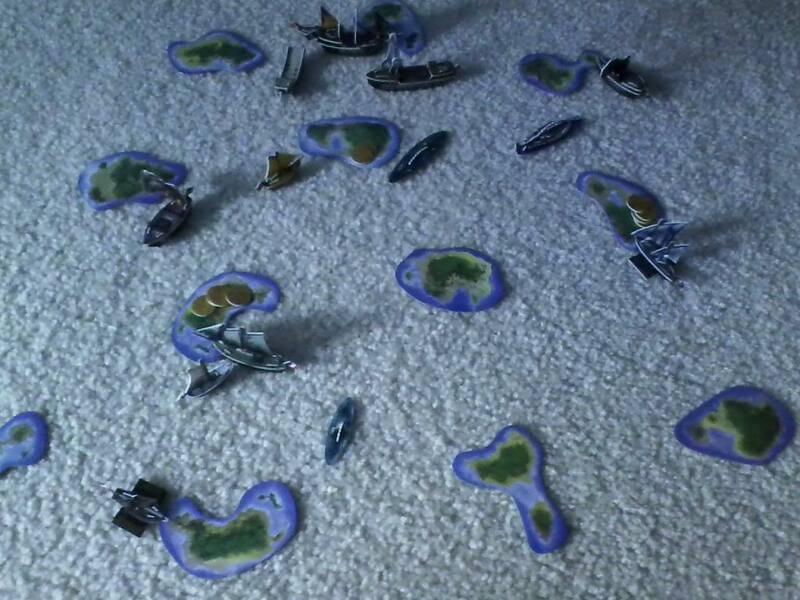 The above fleet went against a Pirate fleet with 3 new ships (I had to punch them and everything!) and El Tejon, a superb support gunship with the sniping ability (double the range of this ship’s cannons, hit only on a 6). 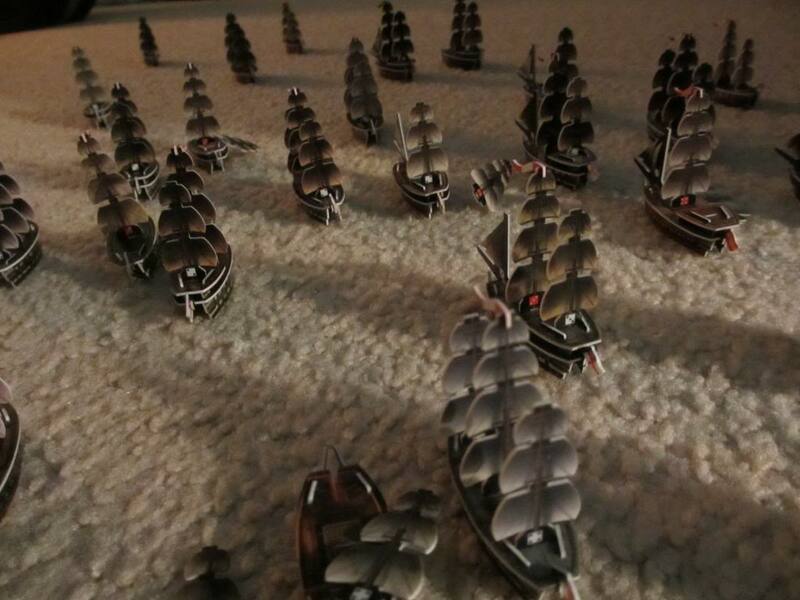 The other ships were the Black Pearl (the uncommon version), the Freedom’s Hand (another two masted sniper ship), and the Adventure, a three masted schooner from CC with 5 cargo that would serve as the fleet’s main treasure runner. 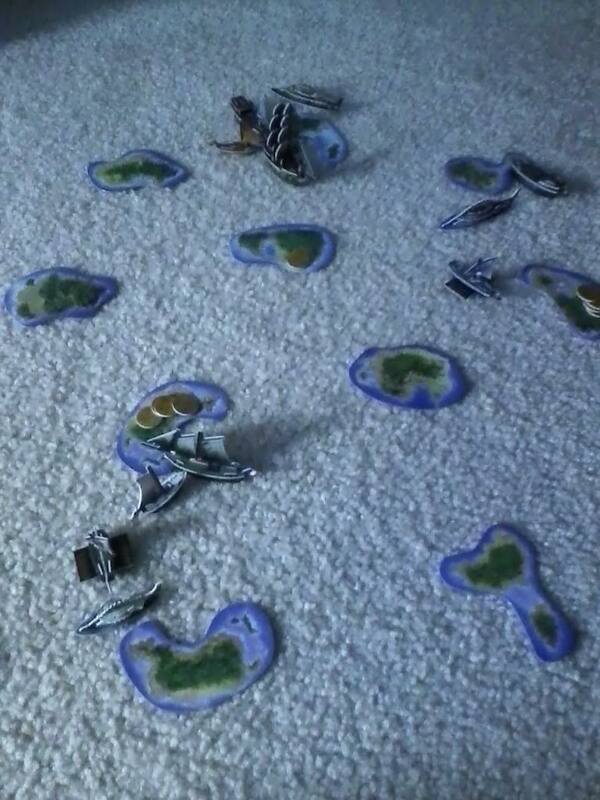 The fleets were 60 points, and a standard setup with 6 islands, 6 terrain, and 16 coins worth 30 gold was distributed. With a tip from CC Mike, I’ve found that games are usually more fun when the islands are 2L apart from each other (like in the old days), rather than 3L. This was the case for this game as well. It also helps the game go a little bit faster, which can help if you have limited time in which to play. 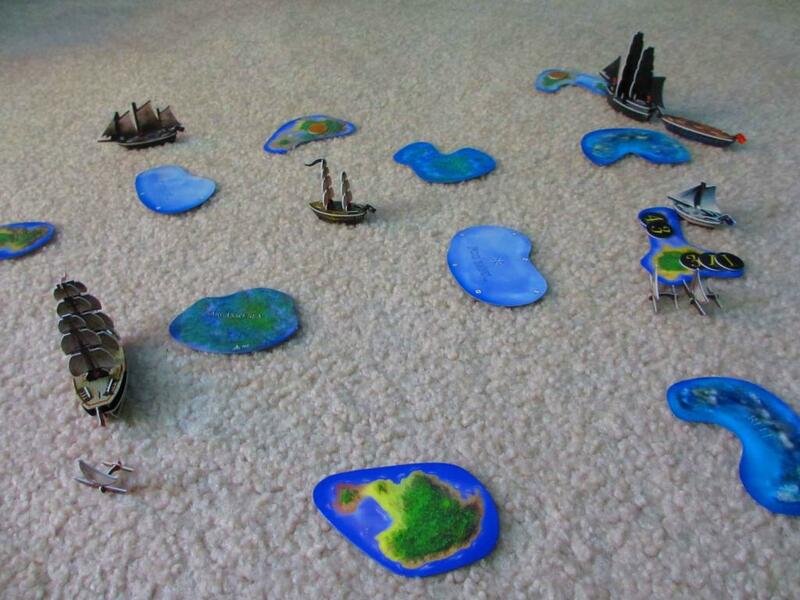 The Spanish were the first player, and the Pirates picked a home island for them in the east. 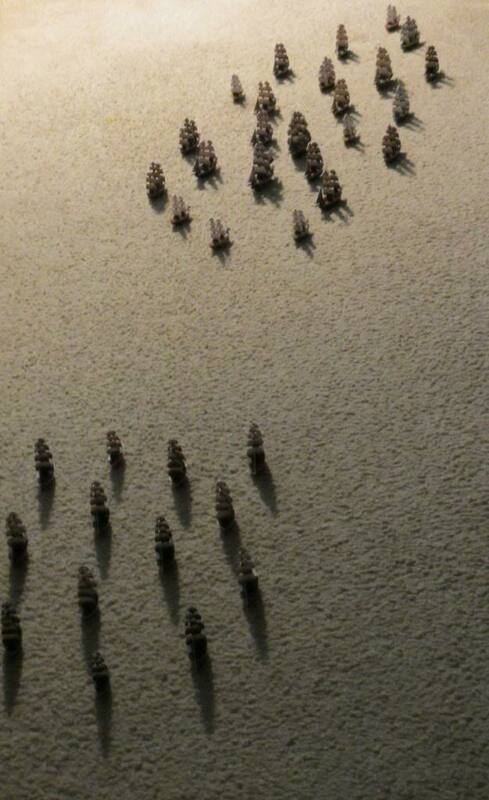 The Spanish went first after picking a western island to be the Pirates’ HI. 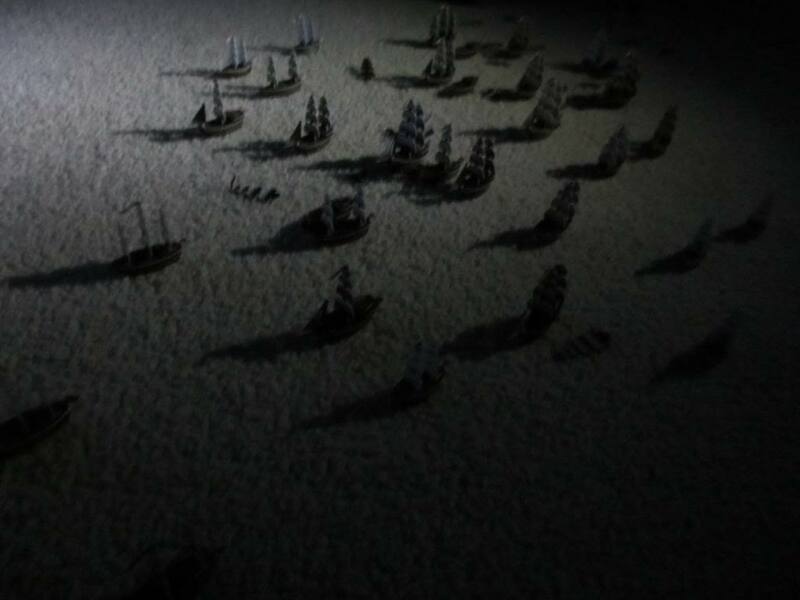 The native canoes were placed by the Spanish on an island just to the southwest of the Spanish HI. On the first turn, the Trepassey sailed southeast at L+S+S since her cargo hold was empty, reaching the first island. There she found 5 total gold.  The canoes emptied their island, leaving one canoe empty. 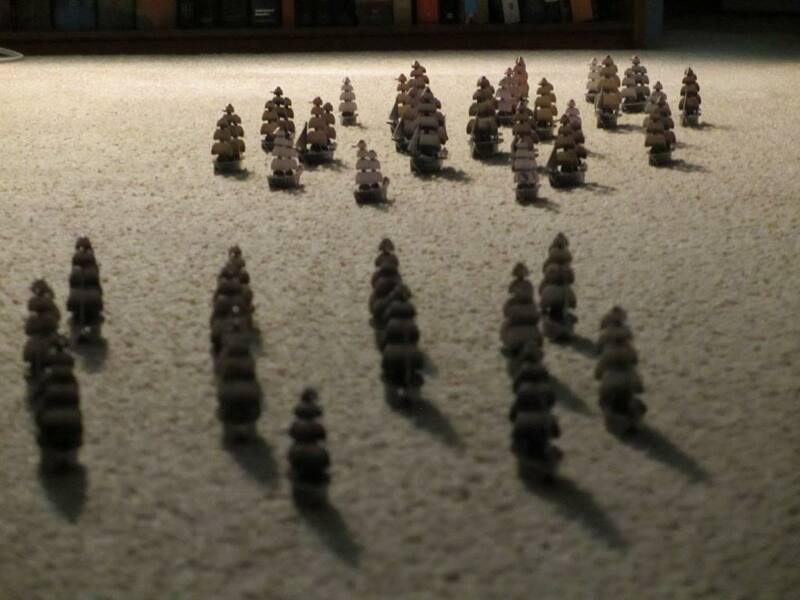 The Garante set off in the direction of the native canoes, in the hopes that they could unite to make the Garante’s guns more accurate. 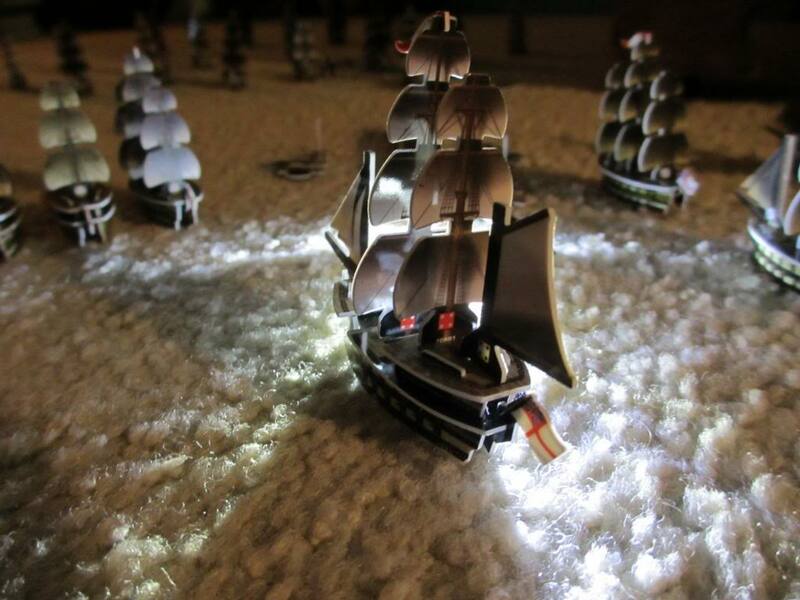 For the Pirates, the Adventure sailed northeast to the nearest wild island, escorted for the moment by the Black Pearl. Due to their sniping abilities and the close distances between islands, the Tejon and Freedom’s Hand were able to get their extra-long range guns in range of the Spanish. With one gun in range, the Tejon rolled a 5 (she needed a 6) and missed the Garante. 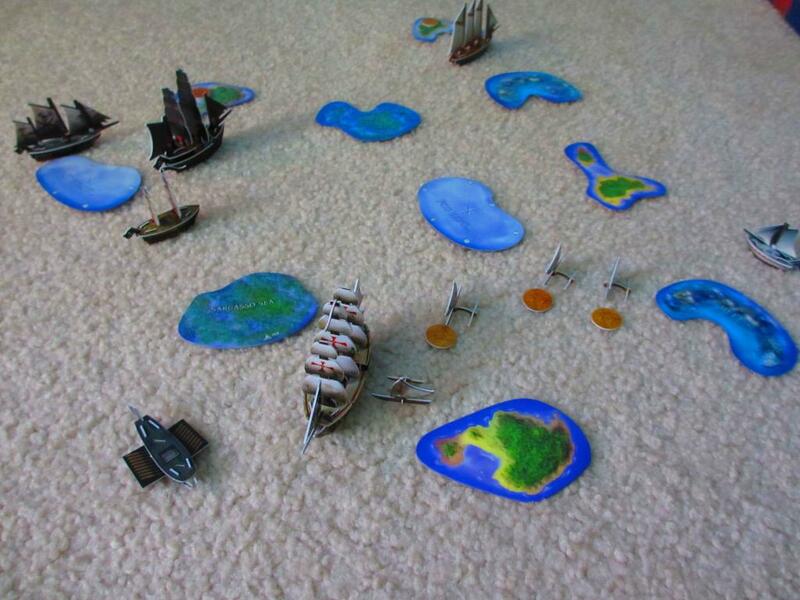 The Freedom’s Hand moved more to the south and sniped a canoe that had loaded a coin from the island, giving the Pirates the gold lead (it was a 1) on the first hit of the game! Her second shot missed, but the Pirates were up 1-0 and the Spanish lost a canoe. On the next turn, the Trepassey headed back to the Spanish HI, while the Rafael made it to the island she was sailing to in the north. Upon exploring, her crew found just 4 1’s, of which she had room for 3. In the south, the Garante was looking to avenge the sinking of one of “her” canoes, sailing into range of the Freedom’s Hand. However, there was only one other canoe within S of the Garante when she shot at the Hand, but it helped. The Garante hit 2 times out of 4, dismasting the Hand and ending the threat to the other native canoes. The canoe that was closest to the Garante was the only one without gold, so the other three headed northeast to return to the Spanish HI. The Freedom’s Hand is a galley, and with a helmsman she was able to move S+S away from the Garante, looking to head home and repair. 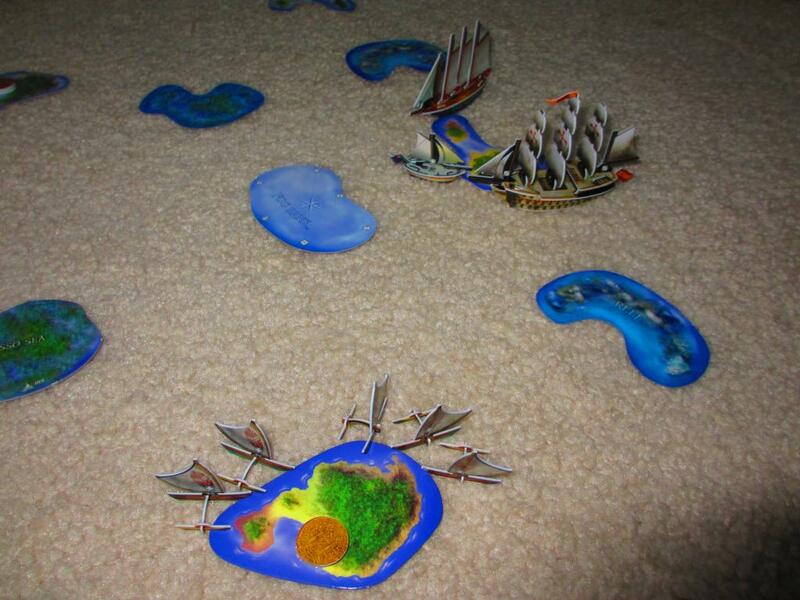 In the meantime, the Adventure loaded 3 coins from a wild island. At this moment, the Pirates faced the first dilemma of many that they would encounter in this game. 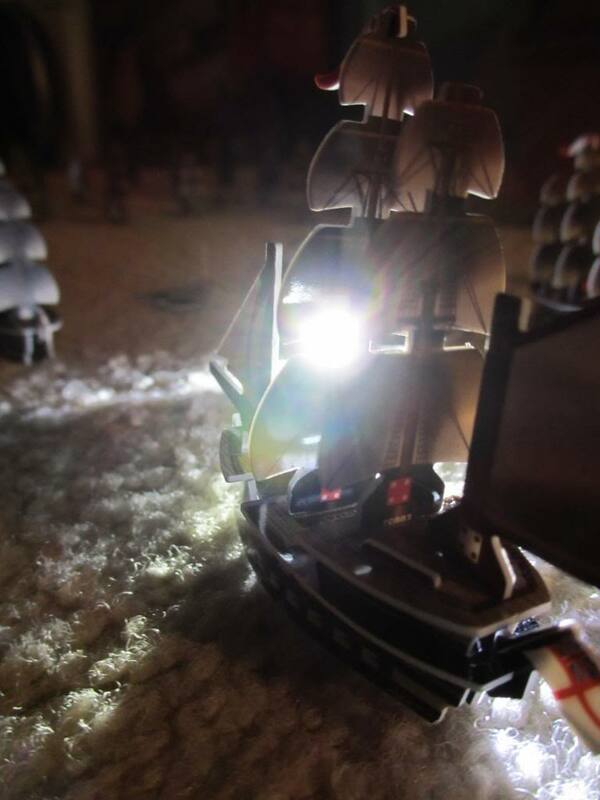 Between the speed of the Black Pearl (L+S+S) and the range of El Tejon’s cannons (2L, or L+L), this Pirate fleet has considerable long range firepower and striking capabilities (plus all four of the Pearl’s guns are long range). However, the speed (L+S) of the Tejon meant that it would be very difficult to get both of her regular guns in range. They measured multiple times, but they determined that they had two options. The Tejon had only one canoe in range of her regular (non-doubled range) cannons, but with the extended range she had 2 canoes in range. At this point I consulted the Pirate Code to find out if you can double the range of only ONE (or maybe 2 out of 5 if it was a bigger ship like the Neptuno) of the ship’s cannons, and roll regularly on the other one. The Pirate Code didn’t say, so I’m asking in the Rules Thread. 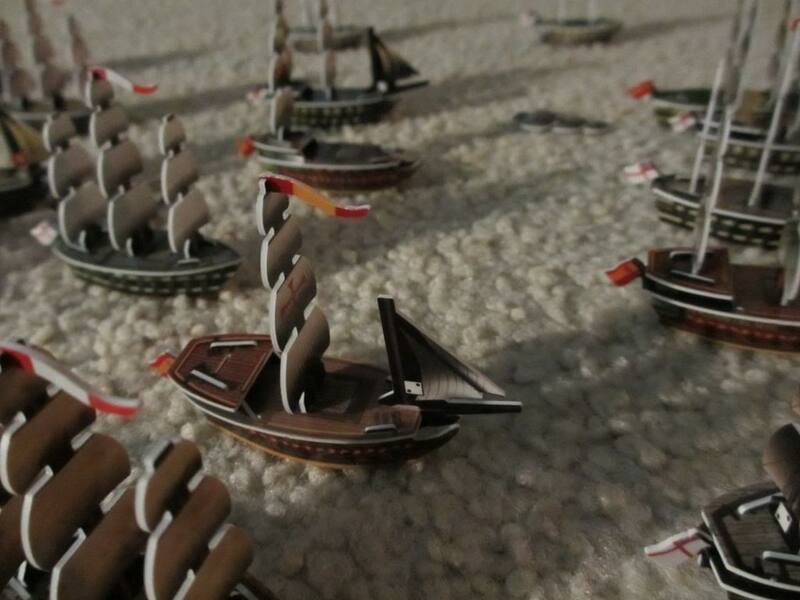 However, the ability text reads: “You may double the range of this ship’s cannonS each turn, but you must roll a 6 to hit.” Since it says “cannons”, I ruled that it can’t shoot one cannon at L and the other cannon at L+L on the same turn. 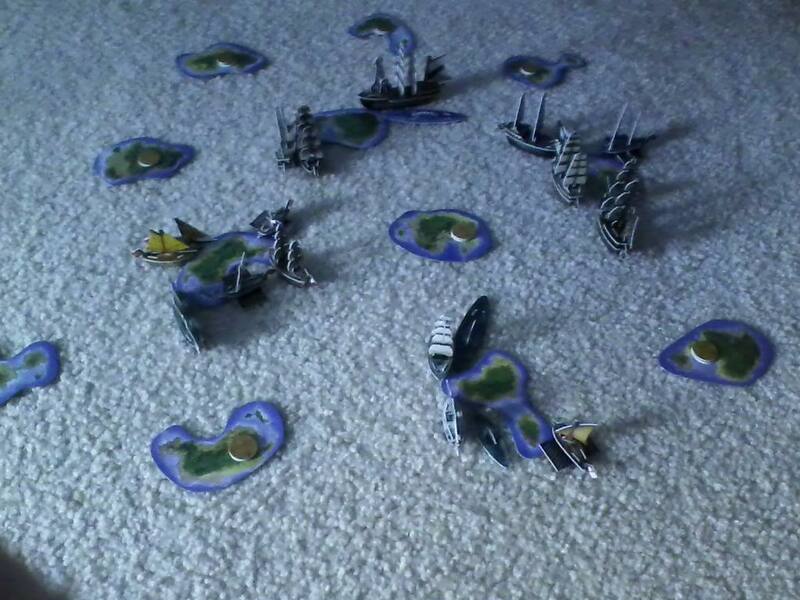 Therefore the Pirates were faced with a choice of shooting once at 2L or twice at 5L. They decided to risk shooting twice and rolled a 4 on the first shot. However, the second shot was a 6! As it happened, the shot that hit was on the canoe that was already within L range. In the end, a second native canoe was sent to the bottom, but she had a 2 on her. 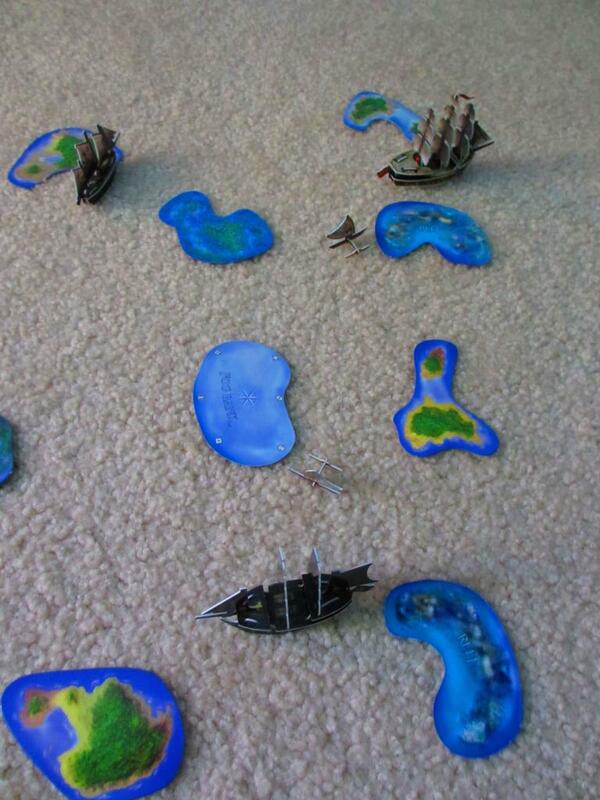 The sunken treasure was split 50/50, giving the Pirates 2 gold to the Spaniards’ 1. 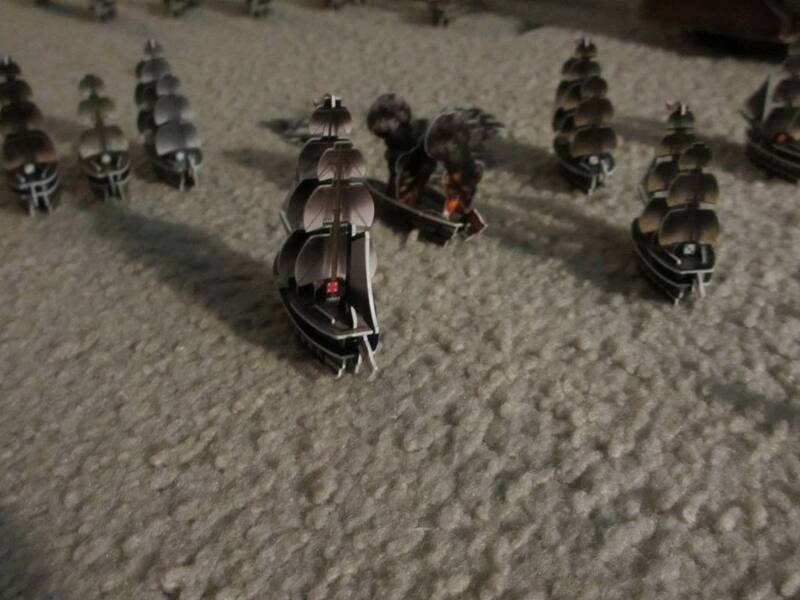 Edit: Woelf ruled that you actually CAN double the range of only one of the ship’s cannons. 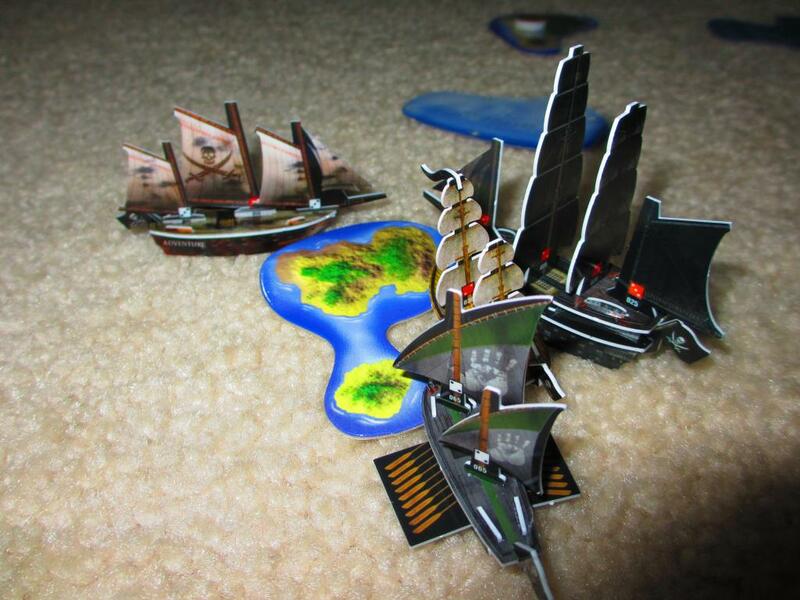 The Black Pearl sailed behind the docked Rafael and promptly shot away all four of her masts in a perfect 4/4 shoot action! On the next turn, the Trepassey docked home 5 gold, giving the Spanish 6 overall. Next to dock were the two remaining canoes that held gold. Fortunately for the Spanish, these were the two canoes that had the highest value coins of the four original canoes, a 4 and a 3. However, the +1 gold bonus from the ability of the canoes brought the total value of the gold to 9 (4+3+1+1), which left the Spanish at 15 overall, only 1 gold away from winning! Now it was time for the Garante to move. 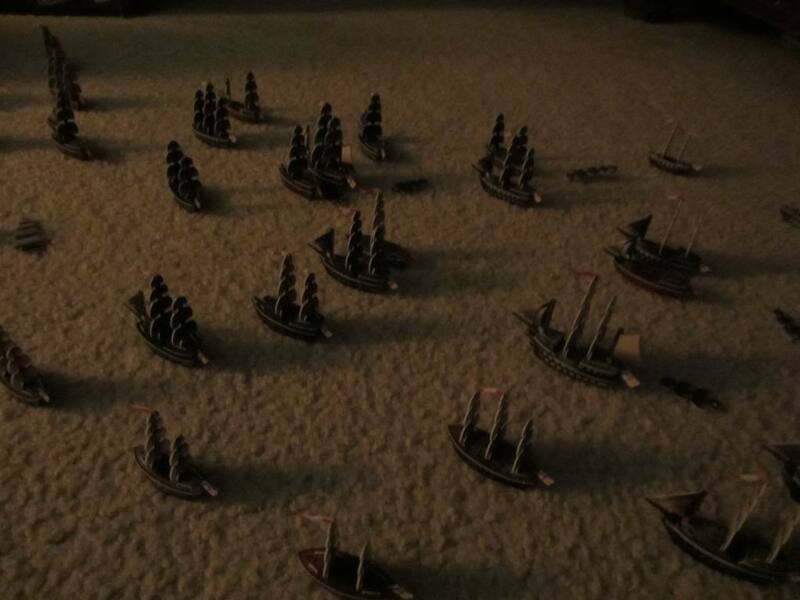 When she sailed south to attack the Freedom’s Hand on the previous turn, this allowed the Tejon to sink one of the canoes. The Garante still had to turn around and sail northeast to get at the Tejon, which would have taken two turns (there was also a Sargasso Sea in the area to complicate things). 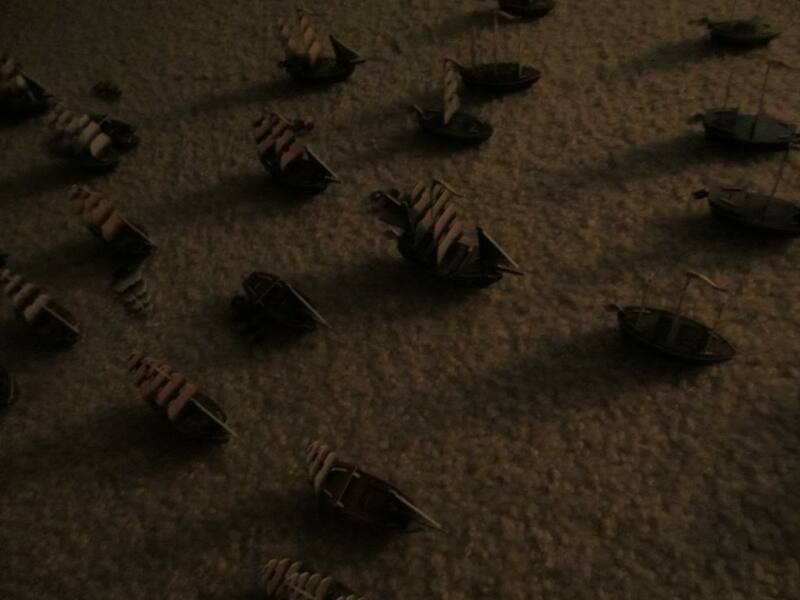 In the end, she sailed northwest to pursue the fleeing Freedom’s Hand, and easily sunk her. The canoe without gold continued to follow the Garante to give her +1 to cannon rolls. With 15 gold, the Spanish could taste victory. 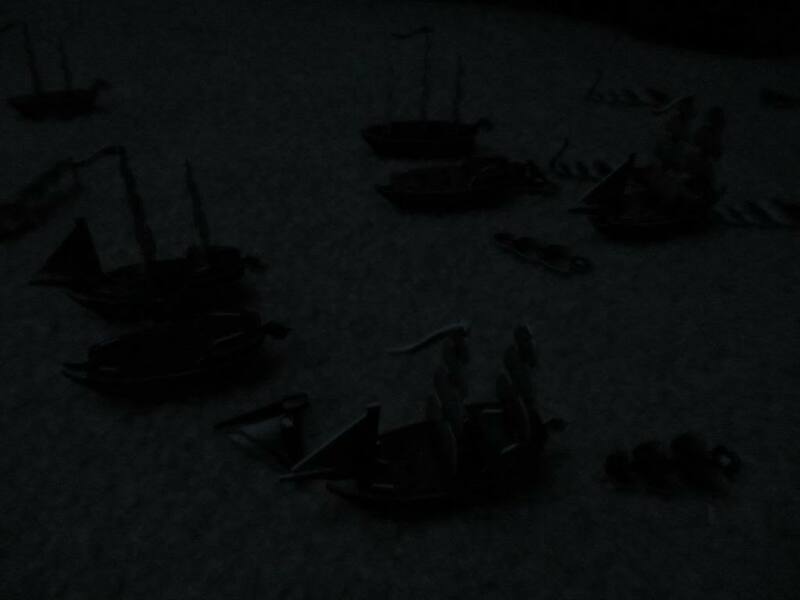 Knowing how powerful the Black Pearl and the Tejon were, they looked to the fastest way to win: sinking the Rafael. If the Rafael and the three gold (all 1’s) on her went under, the Spanish would win either way. 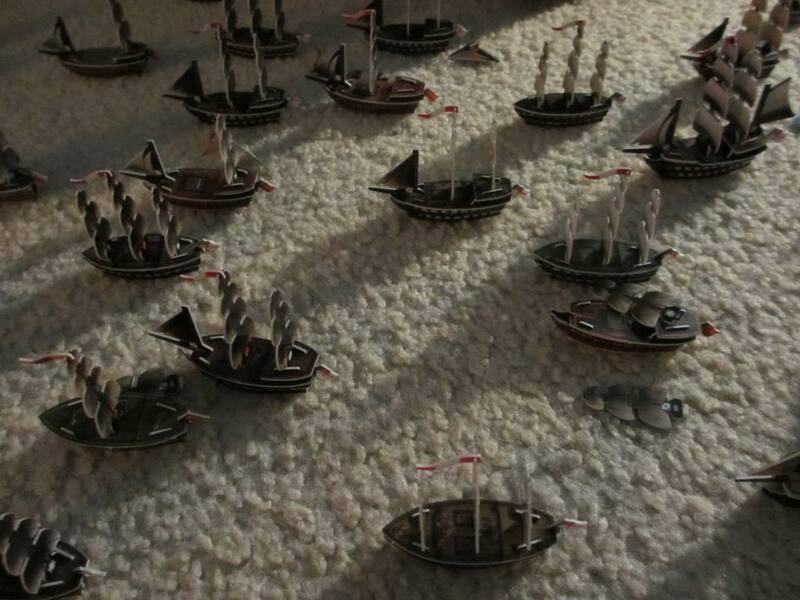 If the Pirates sank her, they would receive 2 gold and the Spanish would receive 1 gold, giving them 16 gold and the win. If the Spanish could scuttle the Rafael, the 3 gold would be removed from the game, which would only leave 14 gold left in play for the Pirates (30 gold – 13 actual gold on Spanish HI since 2 are “tallies” = 17 – 3 gold from Rafael = 14 gold < 15). The Pirates needed the gold from the Rafael and all but one gold from what was left on the islands in order to win the game. 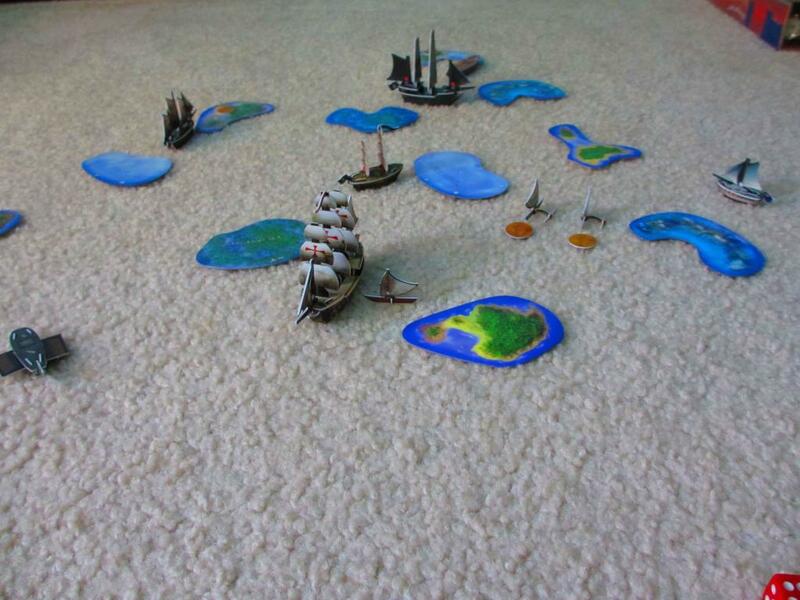 The Spanish rolled a successful 5 on the scuttle attempt, but the Black Pearl captured the Rafael on the Pirates’ turn, making her a member of the Pirate fleet. The Adventure headed home with gold. The Tejon had turned around and now went after the Garante, since the canoes had already docked home their gold. The Tejon just barely managed to get both of her guns within L+L range, and hit with one of them, taking out one mast on the Garante. 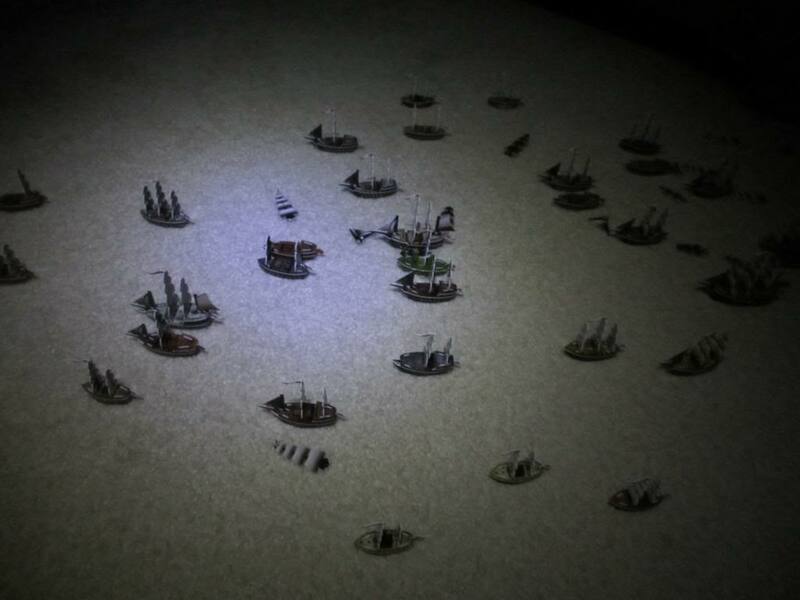 The Spanish took their turn and sent their remaining treasure runners (the Trepassey and the two canoes docked at their HI) to the southeast island that the Trepassey had already explored, since they knew that the one gold on the island would win them the game if they could get it home. 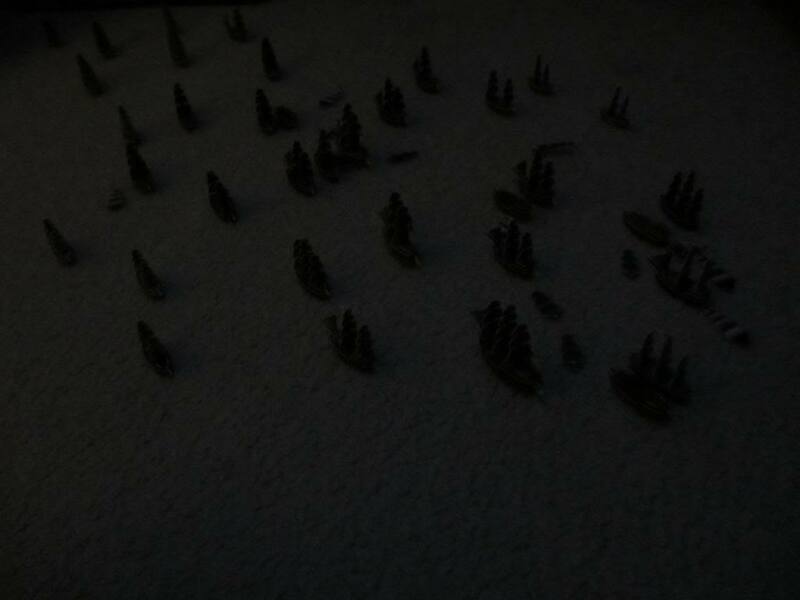 The Spanish sent all three in order to have strength in numbers, hoping that the Trepassey could get the coin home while the canoes ran interference. 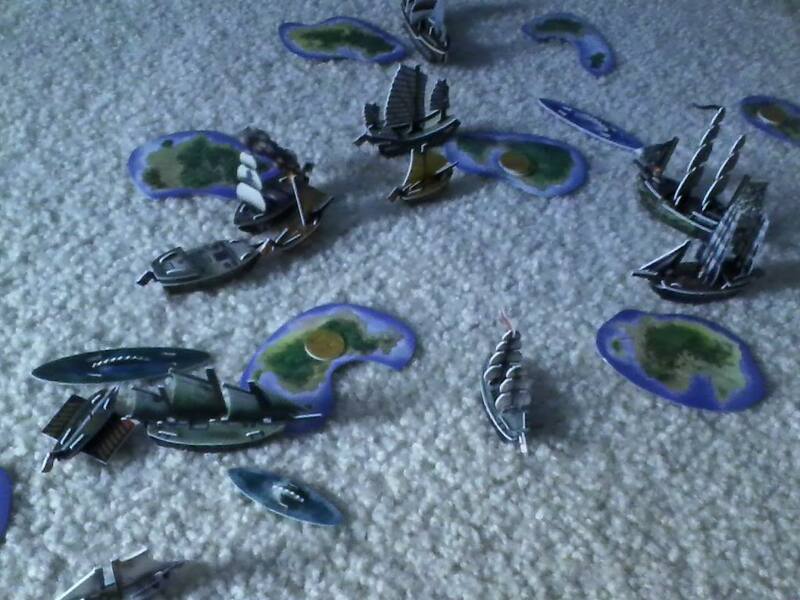 In the meantime, the big bad Garante decided she’d had enough of the Tejon’s sniping actions, sailing around the Sargasso and sinking the Tejon with help from the canoe that was still following her. In fact, 2 out of the 3 hits were 3’s, which would have missed if not for the +1 provided by the canoe being within S of the Garante! 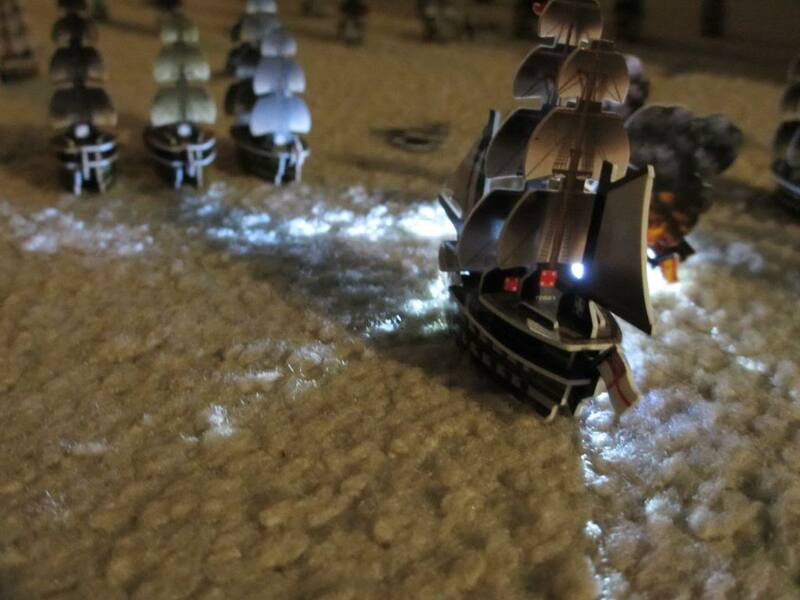 With that, the Pirates had both of their snipers sunk, leaving them with the Adventure and the Black Pearl. The Adventure docked home 8 gold, bringing the Pirates to 10 gold total. The Spanish still led 15-10. 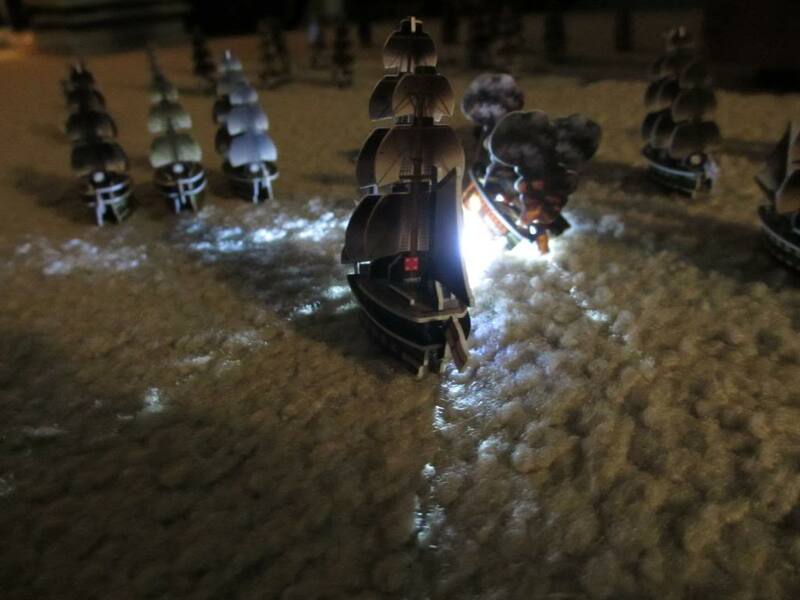 Since towing the derelict Rafael would slow the Black Pearl down (although not very much, since I believe the Pearl would still be able to go S+S+S with her ability and helmsman), the Pearl decided to drop her and speed after the three Spanish treasure runners to the south. As planned, the Trepassey grabbed the 1 gold from the southeast island, while the canoes tried to stand between her and the oncoming Black Pearl. 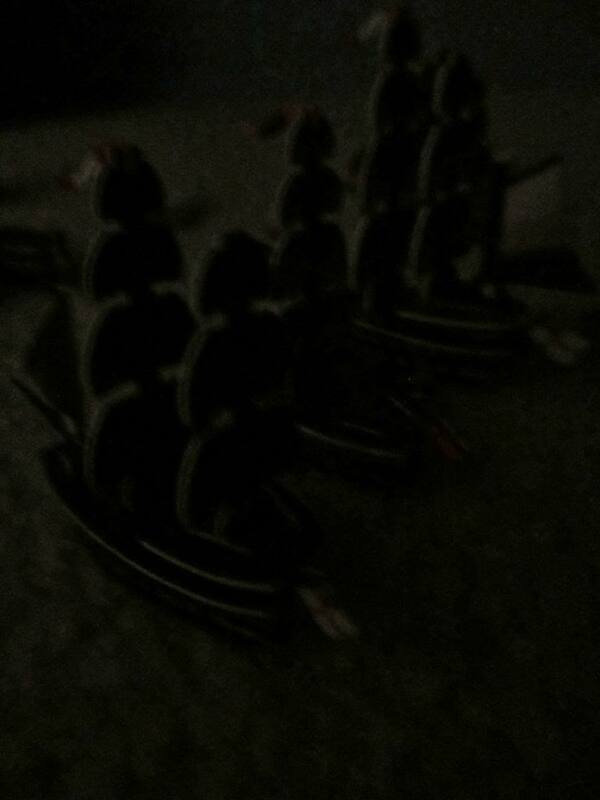 The canoes are tiny, and had no time to orient themselves properly before the lightning fast gunship was upon them. The Pearl managed to get in range of one canoe, sinking it, but was out of range of the other one and the Trepassey. 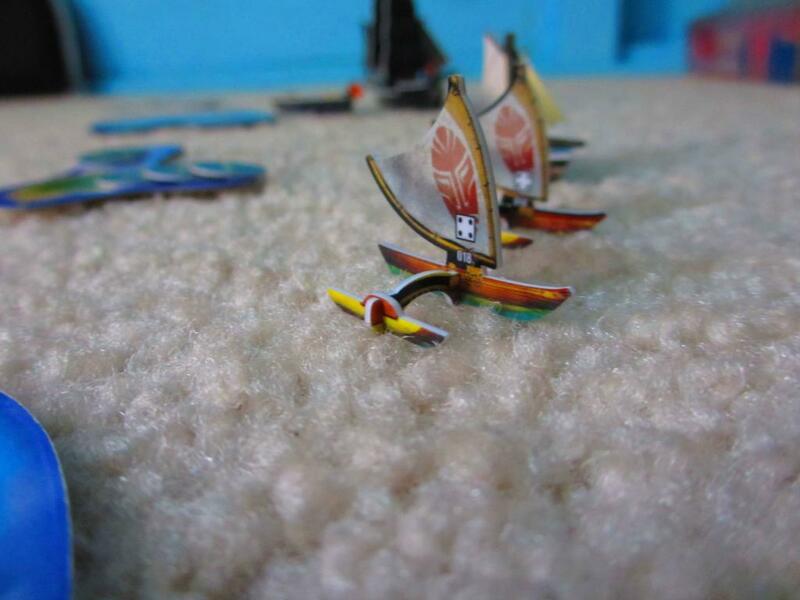 The Garante sailed east towards the action, with her trusty canoe following right behind. 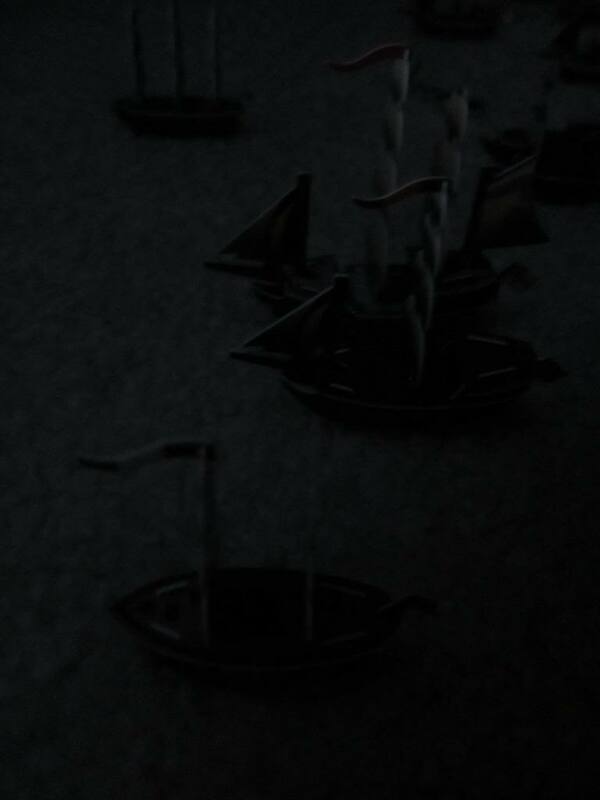 The Adventure set out to the east as well, knowing she was probably too slow and too late to help the Black Pearl. The game was coming to a thrilling conclusion! 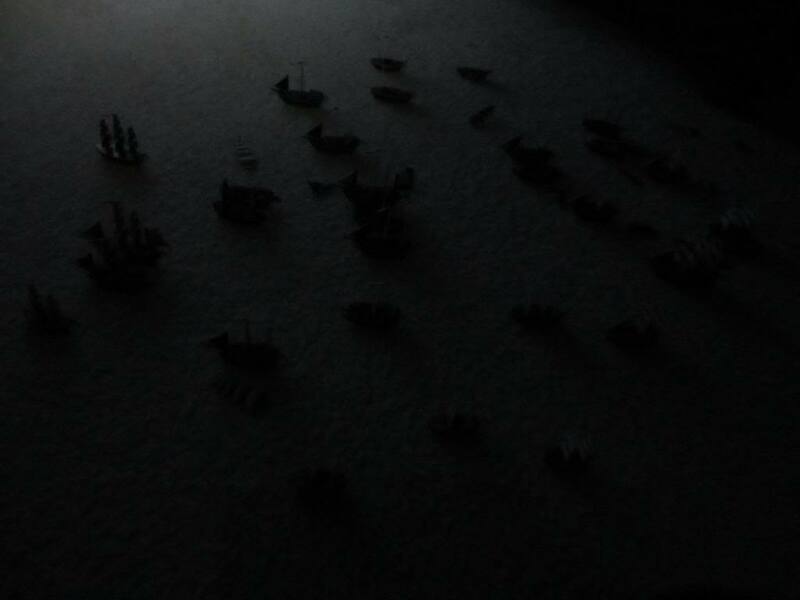 The Trepassey was desperate to avoid the Black Pearl, sailing around a reef in the south and trying to get home. 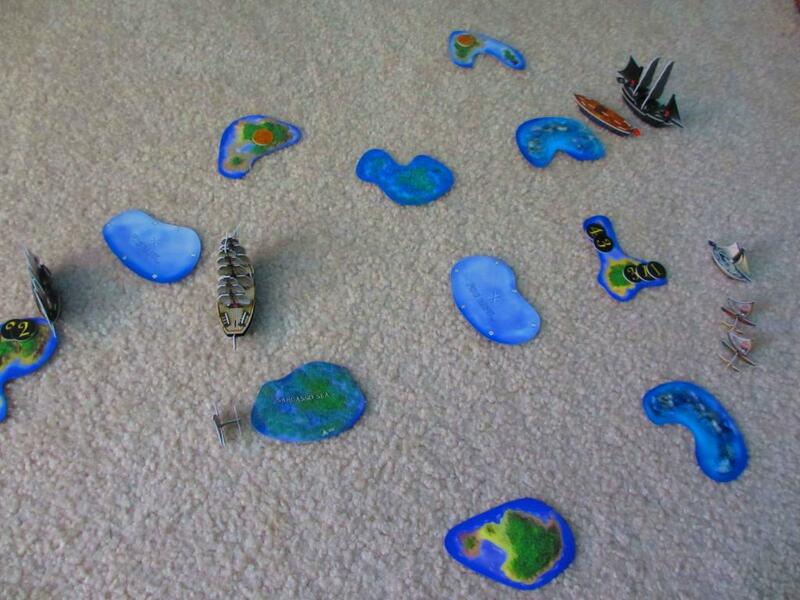 The Garante headed northeast around a different reef to sink the Rafael, who was now a Pirate ship but also a sitting duck. 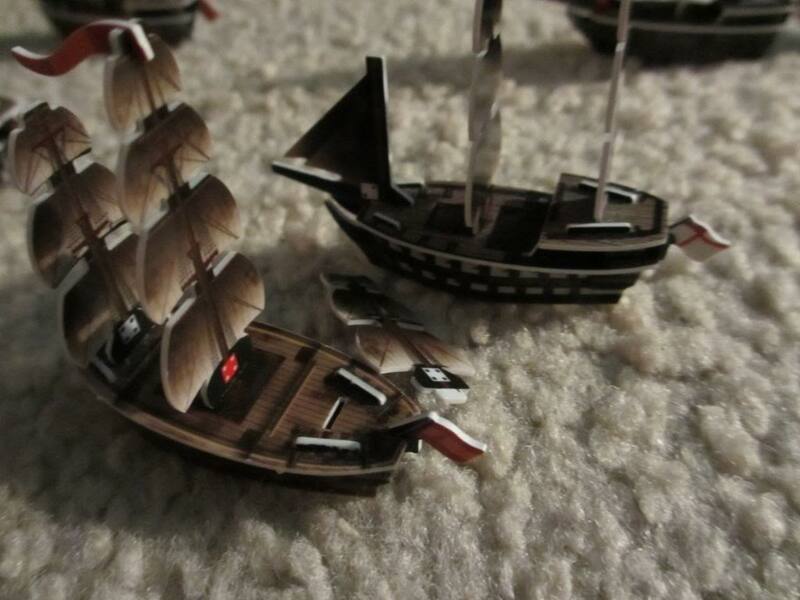 Here was another Pirate dilemma: the Black Pearl had to either sink the Trepassey, who had the winning gold aboard, or attack the Garante, who was about to sink the Rafael and therefore force the end of the game. 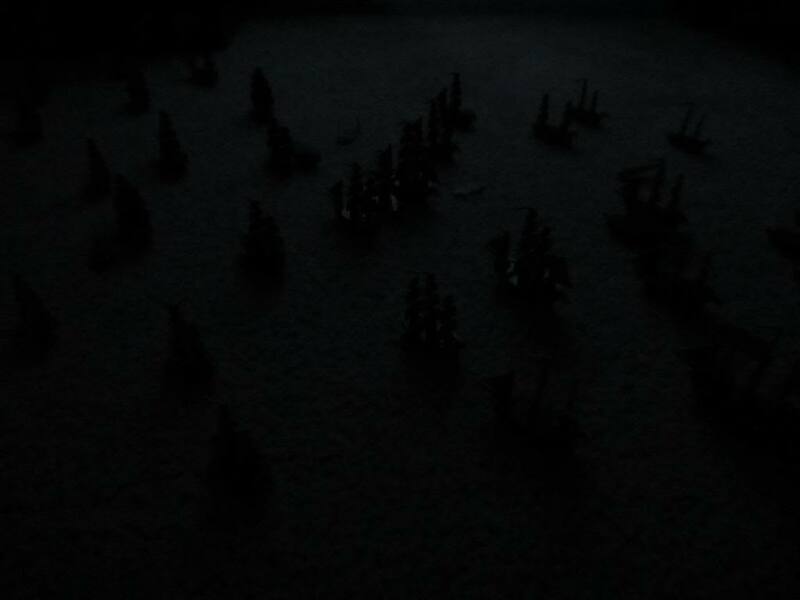 Their decision was made easier due to the fact that the Trepassey had just gotten within L+S of the Spanish HI (L+S is her base move when carrying treasure), so the Black Pearl had no choice but to sink the Trepassey.  In addition, the Black Pearl would have needed to hit all four times to guarantee (no pun intended) that the Garante would be dismasted and therefore not able to sink the Rafael. 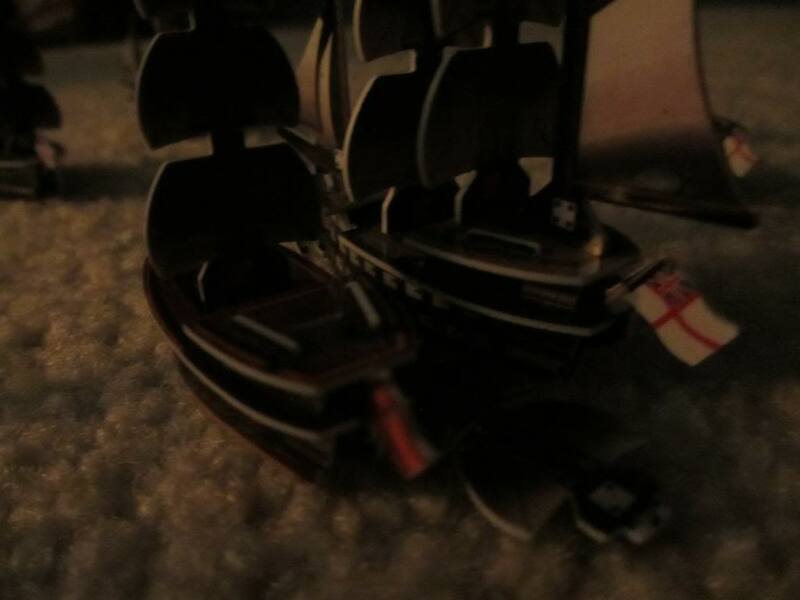 The Black Pearl sank the Trepassey, giving the Pirates the 1 gold on her (Spanish lead 15-11). 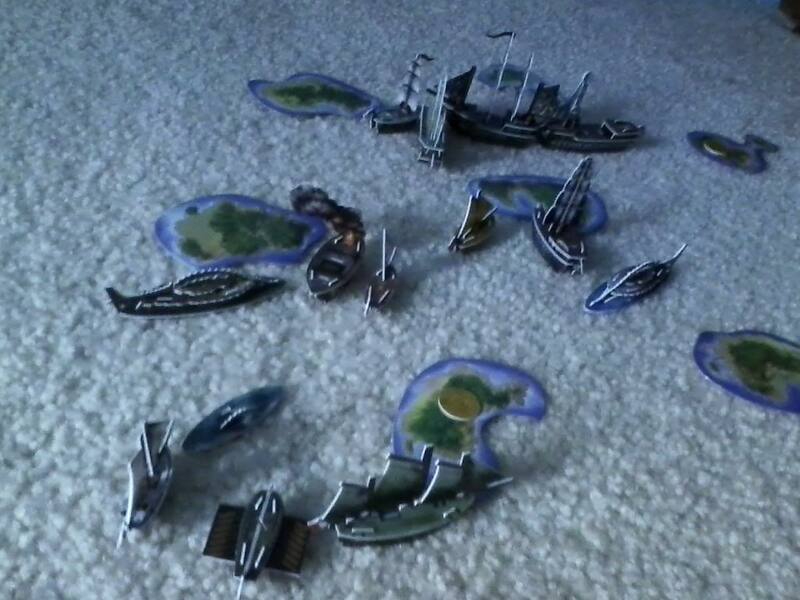 It was inconsequential, but the Adventure picked up the 2 that was still lying on her island from earlier in the game. 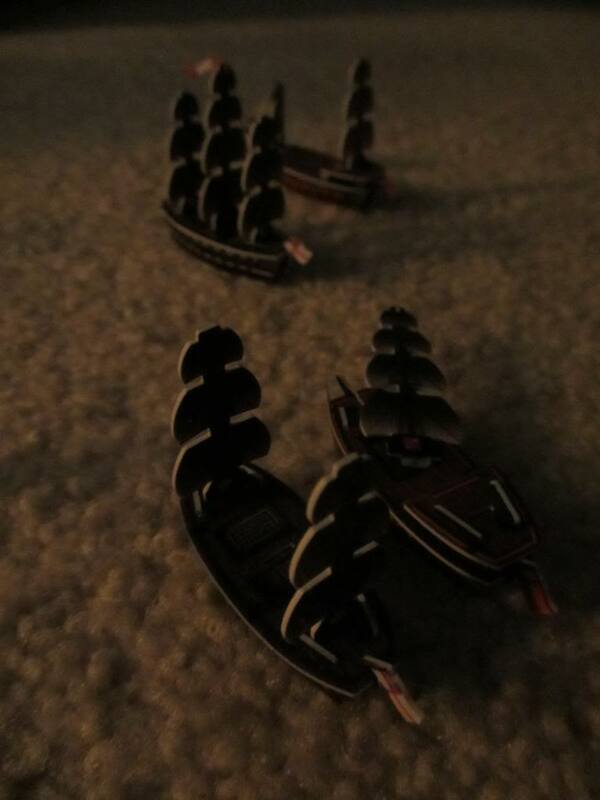 On the next turn, the Garante sailed into range of the Rafael and tried to sink her to end the game! 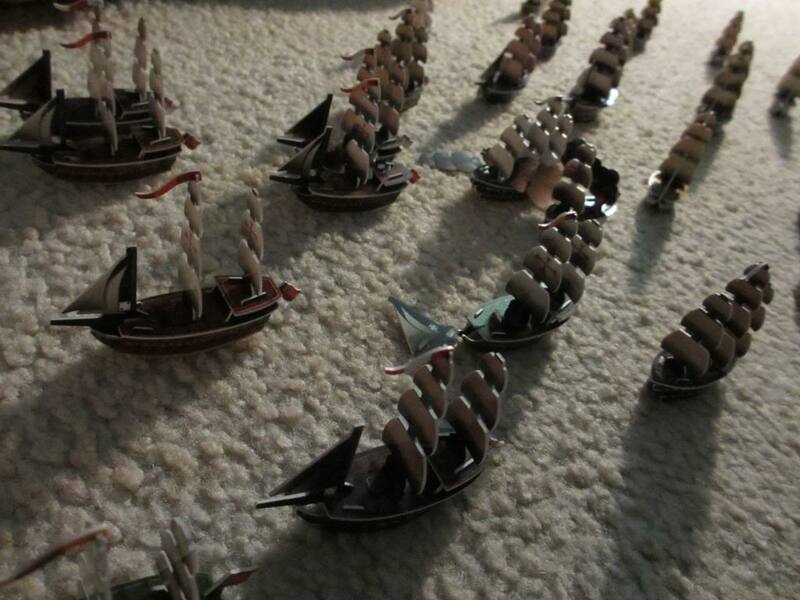 Although the Spanish had been ahead in the gold race for a while at this point, the Pirates had many opportunities for false hope, even to the very end. The Garante missed on her first three shots, and only on the final shot did she roll a 3, sinking the former Spanish ship to give the Spanish a 17-12 victory! (the Spanish got 2 of the 3 gold on the Rafael, with the Pirates getting the other 1) If that native canoe wasn’t still following the Garante around, the Pirates would have had another shot! So although the strategy of using the native canoes to support the Garante didn’t work as well as planned, with only one canoe providing any cannon bonus, that one canoe made all the difference! 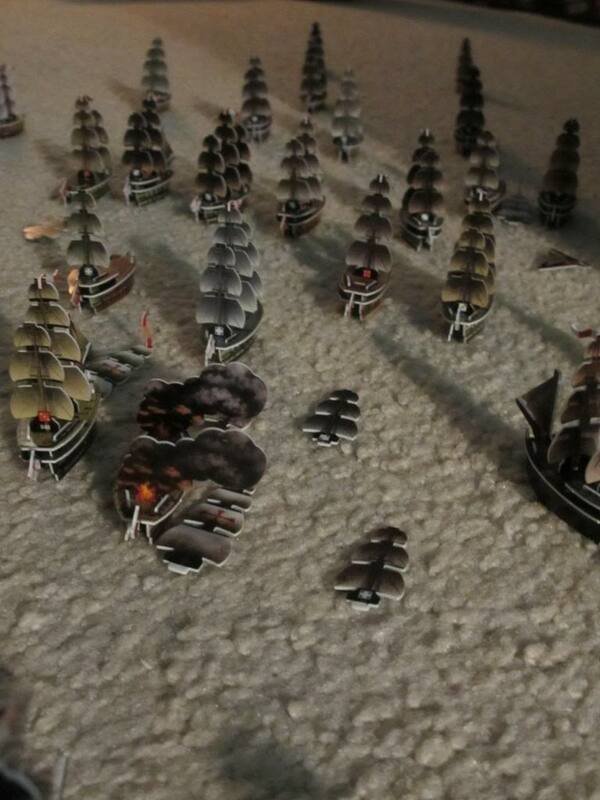 Towards the end of the game the Pirates realized that they could have kept towing the Rafael. The Black Pearl had a captain and helmsman aboard, so even with the Rafael in tow she would have sailed at S+S+S, probably fast enough to sink the Trepassey anyway. 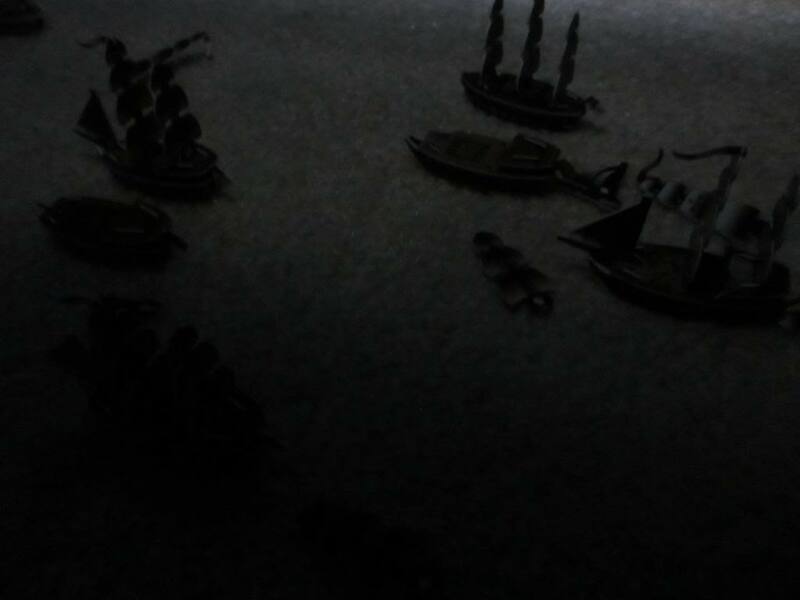 In this way, however, the Rafael would have been mobile and farther away from the Garante than she was in the actual game, not to mention that the Garante would have to deal with the Black Pearl if she had wanted to go after the Rafael. It’s likely the Spanish would have won even if the Pearl had towed the Rafael around after she had captured her, but it is interesting to think about nonetheless.